Fully customizable arcade controllers, adapters, and accessories for Atari 2600, Atari 7800, ColecoVision, and compatible consoles and computers. Classic arcade ball joystick controllers for use with the Atari 2600, Atari 7800, ColecoVision, and compatible systems/computers. Use any Sega Genesis controller with your Atari console. The Easy 78 input/output board simplifies the process of making your own Atari 2600/7800 controller by eliminating the need for a direct wiring harness. The Super Arcade Controller Plus delivers amazing arcade gameplay on three classic consoles, two Flashbacks, and several classic computers. Build your own Super Action-style arcade controller for the classic ColecoVision or Adam computer with an Easy CV input/output board and 12-key membrane keypad from Edladdin! Take classic ColecoVision and Adam computer games to a whole new level with the Super CV - an arcade controller that replicates the controls of the original Super Action controller by Coleco, less the thumbwheel. The Seagull 78 adapter brings two-button gamepad gameplay to the Atari 7800 console with your Sega Genesis-compatible controller. 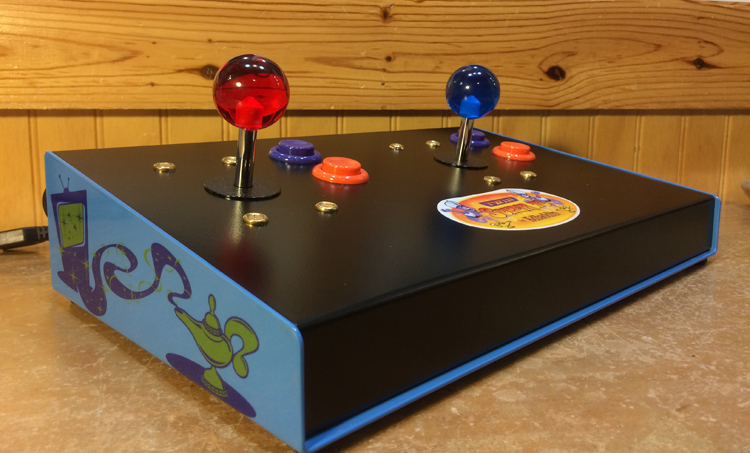 An arcade controller with a Sanwa™ ball joystick outfitted with an octagonal restrictor plate and two pair Suzo-Happ pushbuttons, all mounted in a 14" sloped aluminum housing that is stable on the table or happy in your lap. Free customization! Robotron 2084 comes to life at last on the Atari 7800 with the Super Twin 78! Or play side-by-side with another player on any Atari 2600, Atari 7800, or Atari joystick compatible system or computer. The All-Play 4/8: Supreme 78 delivers instant no-tools switching of the joystick's mechanical restrictor plate while mirror image pairs of Suzo-Happ arcade buttons provide supreme gameplay flexibility. Designed for classic arcade and leaf switch enthusiasts, the All-Leaf: Supreme 78 utilizes old fashioned electro-mechanical leaf switches on all four directions on the arcade ball joystick, as well as on all four classic arcade buttons. Put another six feet (1.8m) of reach between you and your Atari 2600, Atari 7800, or Sega Genesis with this DB9 male to DB9 female molded game controller extension cord. "Atari", "Flashback", "Sega", "Genesis", "ColecoVision", and "Flashback" are trademarks of their respective owners. All rights reserved.